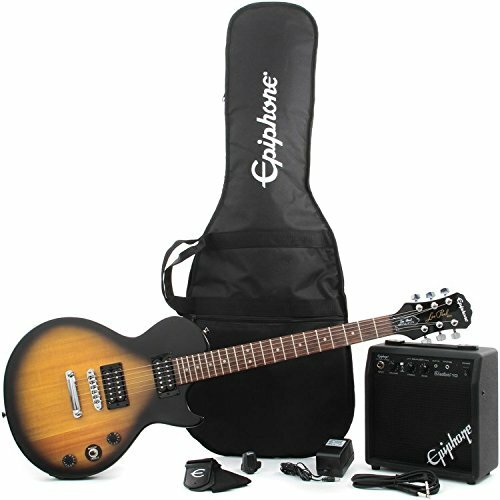 Epiphone Les Paul Guitar pack consists of a chrome guitar tuner, a black guitar strap, a gig bag and some medium pickups; a 10 watt Epiphone amp; a Les Paul Special-II LTD including two humbucker pickups and free guitar lessons. One of the first things comes to mind concerning the manufacturing of a guitar is the question “which type of wood should be used in the process?”. Epiphone decided to use mahogany solid wood to create this beauty. Gathered in Africa as well as Central America, mahogany was used in both the iconic Gibson Les Paul and Epiphone Les Paul. It ranges from medium up to heavy wood that grants a vast range of different guitars densities. It modifies the sound which it makes by making Les Paul produce a soft but fair sound with a decent chug. The top consists of maple wood, which helps provide a bright, concrete tone with slick lows. Mahogany neck is joined with maple top, but it lacks the firmness, fortitude or stability of maple and thus is not acceptable as fretboard material. It emanates with soothing tones with a decent presence in the lows and the lower middles. This combination presented Les Paul with convoluted highs, broad and chunky lows, and a middle section that does not blare. Epiphone Les Paul is equipped with a stop-tail bridge, otherwise also referred to as the “stop-bar bridge”, as it is a specially designed kind of locked hard-tail bridge. They are crucially different from the bridges supplied with tremolo arms, popularly called “whammies” or “vibrato systems”. Two main parts are what stop-tail bridge consists of a flexible locked bridge and an independent stop-bar tailpiece. A bar-shaped constructed metal part usually formed of zinc is what makes a stop-bar tailpiece. The main reason to make use of lightweight metals is to present a transfer more intense of the string’s resonance to the body. The dents drilled into the stop-bar grant for the string weaving from the back and front. The string rail then drives over the saddles, with machine heads being the final point where strings end. The regulation of the strings tension is the primary function of this part. Concerning this model, the bridge design is popularly called “Tune-o-Matic”. It widens the concept of adjusting the string distance between nut and bridge, considering it varies based on the string thickness. The bridge bar comes with six saddles, where each one has a small trench that corresponds to string pattern and shape. Two parallel humbucker pickups deliver quite a punch on the Les Paul. Patented by Seth Lover, a Gibson employee in mid- ‘50s, they were originally intended to simply reduce the humming sound the single coils were giving. Even though the tonality of the guitar is greatly influenced by the wood used in manufacturing process, the pickups have a huge impact on the overall performance. Naturally fat and broad, the humbuckers can still produce a rather solid high notes and possess more than a satisfactory middle section. Epiphone Les Paul Vintage Sunburst may not be best suited for all genres of music due to its heavy pickups, but for hard rock and metal fans, this guitar is a dream come true. Its solid body with maple top gives it all the power it needs if combined with tighter strings it produces a unique and awesome sound. It is a decent guitar to play whichever music you like, but its specifications are best optimized with heavy sounds. The mahogany tonewood gives Les Paul its fabled majestic sound, and if you’re a beginner and do not possess your own amp, the 10-watt complimentary amp which comes with this set would be a terrific start for you. It has its limitations, of course, but for a budget guitar, its flaws are of no significant importance. A promise and a guarantee of breathtaking experience are delivered through Epiphone Vintage Sunburst. Its sound is satisfactory in the terms of playing both at home and for performing gigs. With a pedal or two, the sound of the original Les Paul could even be replicated. The customer feedback is off the charts for Epi, the vast majority of buyers are more than satisfied with their purchase. Despite being for beginners, even the more skilled musicians like to play it while leaving their more expensive guitars for other events. People tend to have rather low expectations when they see such a low price, but the ratings are proof that this is not the case for Les Paul Vintage Sunburst. Out of 780 reviews on musiciansfriend.com, it scored a fabulous 4.3 out of 5. Guitarfella awarded it with an average of 4.5 out of 5 possible stars, pointing out the majestic value and electronics, while not being entirely satisfied with hardware. It came first place in a review on “top solid body electric guitars”, and is often referred to as “the perfect starting ax”. The many goodies that come with this set like the bag, amp, cable and a guitar lessons disc may have had an impact on the ratings as well. In this Epiphone Les Paul Special II Vintage Sunburst Review you can find all the info you need on the glorious sound and precise craftsmanship of the Epi, and if that’s not enough to convince you of its superiority amongst budget guitars, simply ask any music store salesman to lend you one if they have it in stock. A single strum on the Epi’s strings is more than enough to make you fall in love with it.